Brands are investing more heavily in content marketing as a way to attract loyal customers. From white papers and social media posts to paid advertising, blogs, and email campaigns, they are pulling out all the stops to add value to their customer relationships. In a way, they are starting to think like journalists. Content analytics is one way that brands can measure the success of their digital content; it involves analyzing data from both inbound and outbound collateral to figure out what’s working and what’s not. After all, no one wants to spend hundreds or even thousands of dollars on content that isn’t resonating. It should come as no surprise, then, that 75 percent of enterprises think content analytics can provide real business insight: What are your customers most interested in reading about? What format generates the most engagement? You can use answers to these questions to help you decide what content you should be producing, how to present it (quiz, paid ad, slideshow, blog post, etc. ), and where/when to post it for the best results. If utilized correctly, content analytics can offer brands a way to build customer loyalty and boost revenue. To truly see the effectiveness of your content marketing strategy, you’ll first need a clear list of defined goals: what are you hoping to achieve with your content? Goals may include things like building brand awareness, getting email subscriptions, and increasing reader retention and loyalty. In the same way that digital publishers have different goals for their sites, it is unlikely that any two brands will have the same goals. What sources attract the most visitors to your site (blog, Twitter, SlideShare, etc.)? Is your audience engaging with the content you’re producing? By regularly viewing KPI business metrics, you can see whether your content is thriving or flopping. But that’s only the beginning of what content analytics can bring to your organization. Advanced content analytics strategies should help you to look beyond the numbers and to focus on taking action. Content analytics is not a mirror reflecting how your company’s content is performing; rather, it is but one tool that can help steer you towards actionable solutions and more effective content choices. To ensure you’re using your metrics for the greater good, avoid looking only at vanity metrics such as page views and social media shares. This type of data cannot provide you with enough insight when considered alone. That’s not to say it isn’t useful, though. You just have to contextualize your vanity metrics in terms of your organization’s larger goals, which could be anything from boosting sales and getting email subscriptions to increasing knowledge about a particular subject. 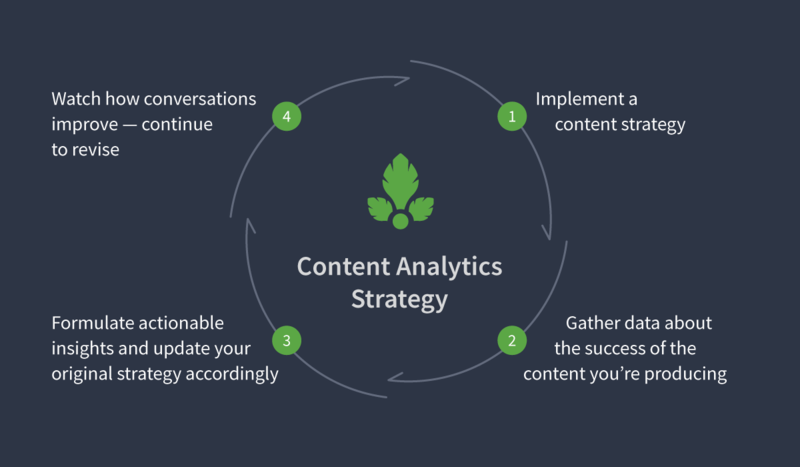 Implementing content analytics at your company is iterative. Metrics provided by content analytics, and the actions you take based off that data, can help you optimize conversion rates. In addition to tweaking your content strategy, you can also build a conversion optimization strategy by testing calls-to-action (CTAs), headlines, subscription forms, etc. Businesses that do this are two times as likely to see a huge jump in sales. And there you have it. Content analytics gives you the keys to transform your content strategy into a dynamic business booster. Many digital publishers have been using analytics to help inform their respective editorial strategies for years. Brands can, and should, follow suit by paying close attention to the data they are collecting from their audience and then crafting content accordingly.